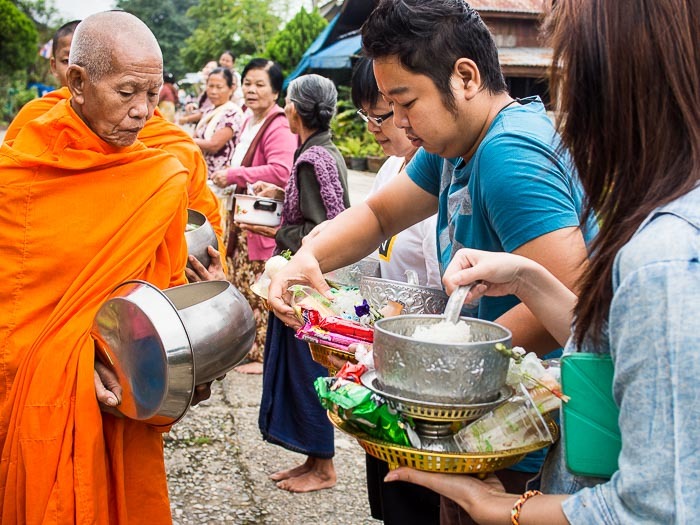 People in the Mon community in Sangkhla Buri present food to monks during the monks' morning alms rounds. 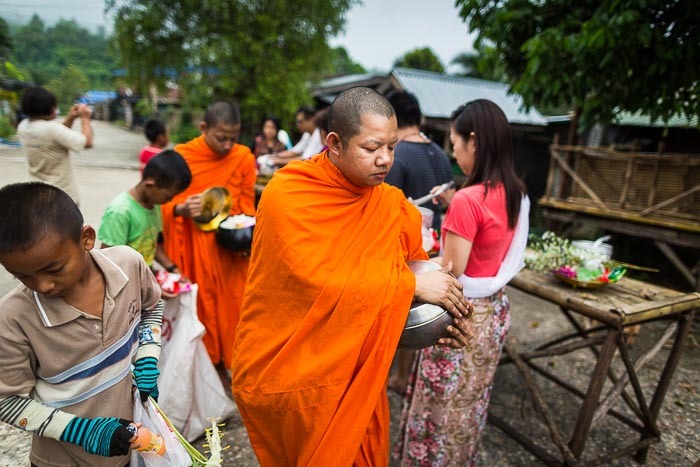 One of the rhythms of life in Southeast Asia is the ritual of Buddhist monks going out on their morning rounds receiving alms from the people in their communities. Whether you're in Thailand, Cambodia, Laos or Myanmar, you'll see monks out early in the morning. Women pray in the street before the monks reached them. When you've photographed monks on their morning rounds as often as I have you start to notice differences from community to community. In Bangkok, by far the largest city in mainland Southeast Asia, monks typically go out by singly and people wait in front of their homes or businesses for the monk to pass by. A donation is made and the monk sometimes prays with the person and sometimes not. Monks on rounds in the Mon community. In Laos (and northeast Thailand), monks go out in large groups, sometimes as many as 100, and people line the streets waiting for them. This scene is most famously repeated every morning in Luang Prabang, Laos, but it's common in parts of Lao influenced Thailand, like Isaan. Monks in Thailand, Laos and Cambodia wear the bright orange saffron robes most people identify with Theravada Buddhism. Monks in Myanmar usually wear darker, almost burgundy colored, robes. Western Thailand, where I am this week, is home to a large Mon community. The Mon people played an important role in Southeast Asia through the centuries. The Mon kingdoms sided with the Siamese (Thai) kingdoms during the Thais frequent wars with the Burmese. The Mon were among the first Buddhists in mainland Southeast Asia (before that Hinduism was dominant - the temples at Angkor, for example, were originally Hindu). Theravada Buddhism was spread through the region by the Mon. In the Mon tradition, when the monks approach people sit in the road, face the monks, and pray. When the monks get to them, people stand and present food to the monks, who pass by wordlessly. 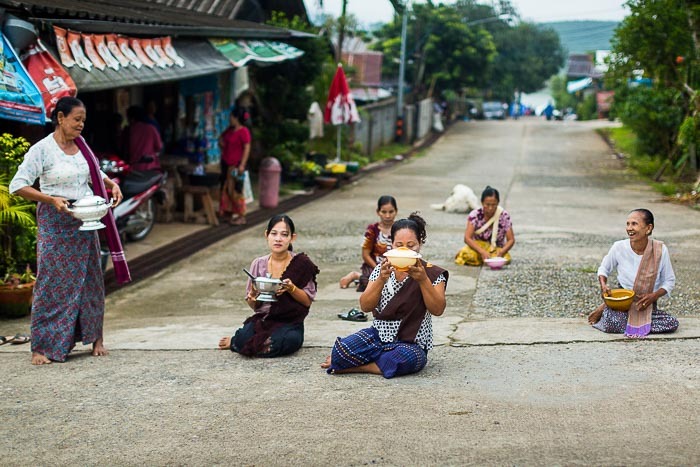 A woman prays as monks approach during the morning alms round in the Mon community in Sangkhla Buri. There are more photos of the morning alms rounds in Sangkhla Buri in my archive or available from ZUMA Press.